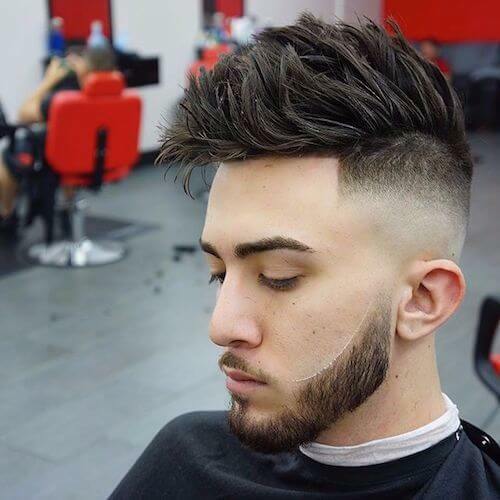 The mid fade haircut has quickly become one of the most beloved hairstyles in the world because it requires low to medium maintenance, it works on all hair types, and looks extremely cool. What started out as a short hairstyle turned into a versatile hairstyling choice. 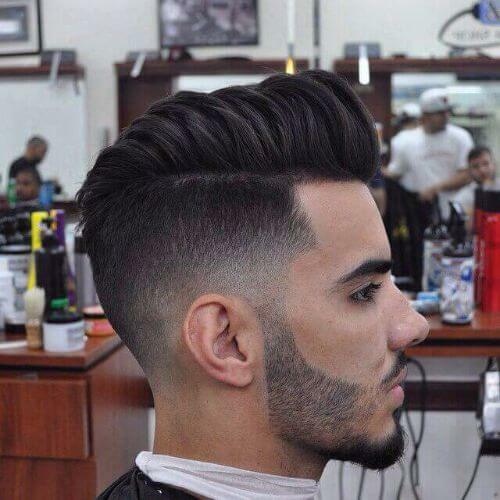 The following awesome mid fade haircut ideas can easily flatter your looks and fashion style. Pick one of the many options below and catch up with the latest hairstyling trends. 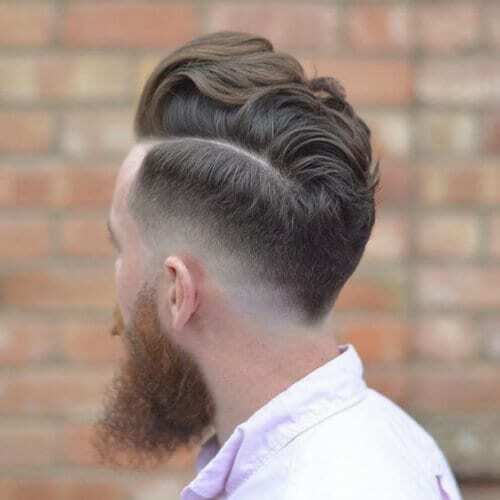 The subtle undercut and the amazing mid fade haircut are bound to be a recipe for success. This sharp look is recommended for all hair types and age groups because it makes you look awesome no matter your age. If you are into low maintenance short hairstyles, this is definitely one inspired choice. 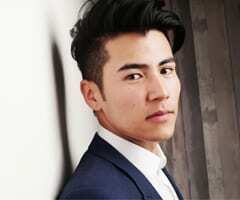 It is a typical look for men with short and thin hair. Add a little hair gel to style this one. 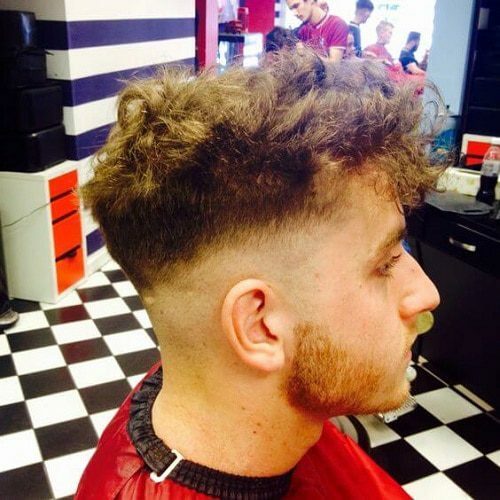 This multi layered mid fade haircut is sported by men who aim for more hair volume. 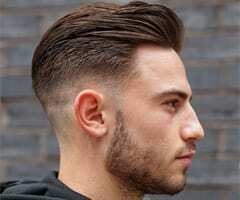 Go for this kind of hairstyle if you have fine hair or a receding hairline. If you love the extra volume, hair mousse is the answer here. This hairstyle works best during hot summer days. If you want to go for a short hairstyle, this recommendation can be one awesome choice. 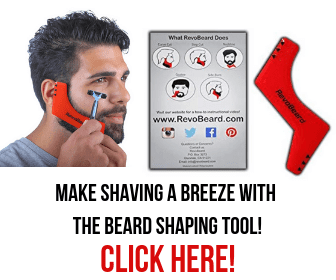 It leaves the nape of your neck exposed while still preserving your locks on top. 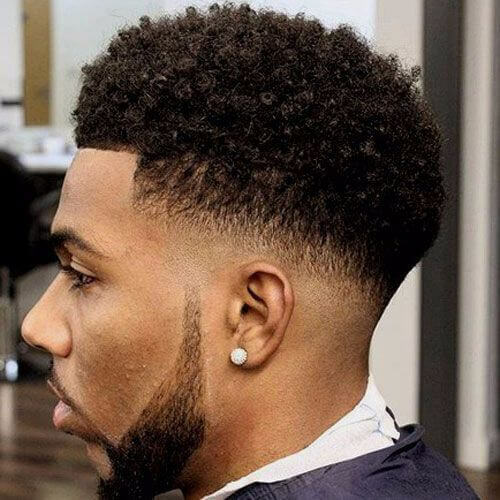 The mid fade haircut works best for short hairstyles. It’s the perfect solution for men who cannot or do not have time to spend styling their hair every morning. You can try out different hairstyles or combine them to achieve a more original look. 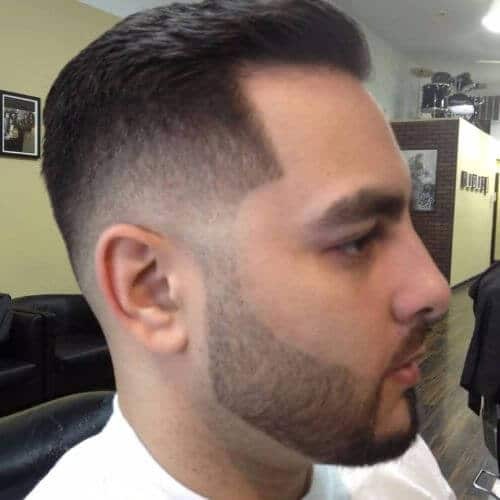 A clean and well-trimmed finish is always the best solution for this type of haircut. 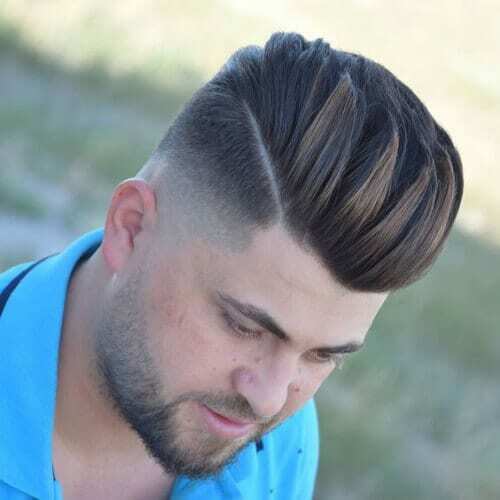 This long at the top hairdo is easily highlighted thanks to the mid fade haircut. The wavy, textured locks are a nice addition, making soccer superstar David Beckham look even more handsome than he already is. 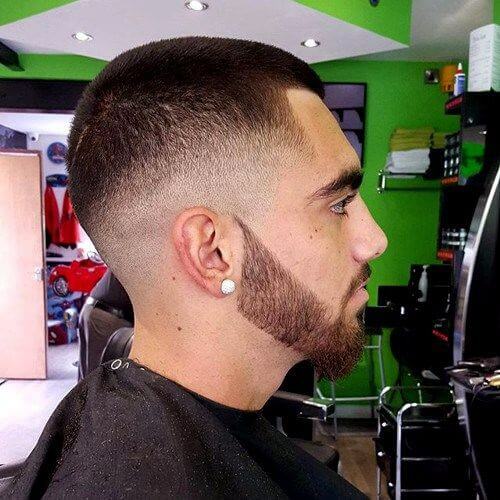 A well-trained barber can give you a fantastic beard that will match your superb hairstyle. Make sure you revisit him regularly so that you can keep that facial hair in check. 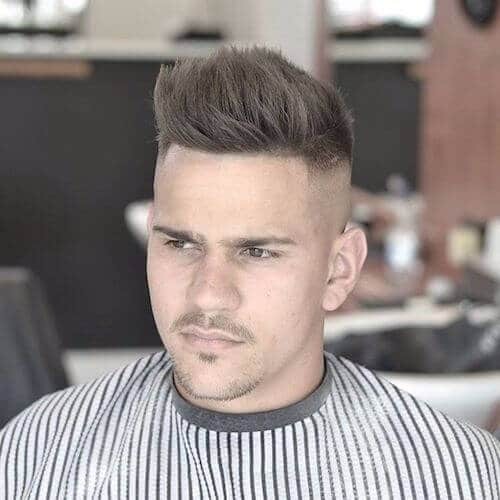 This modern take on the mid fade haircut certainly looks sharp. 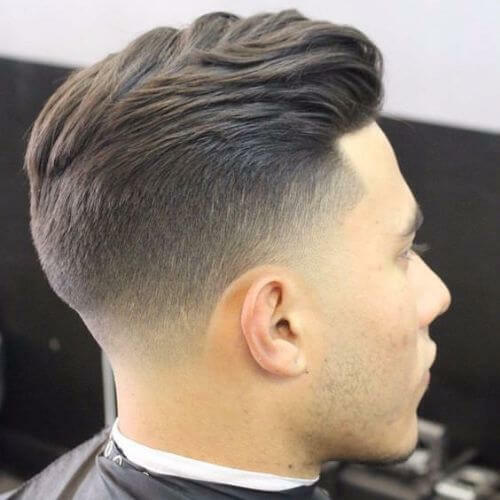 The styled long top and the mid fade haircut are bound to turn heads, especially thanks to the beautiful waves. Some guys like a more masculine, rough-kind-of-look. 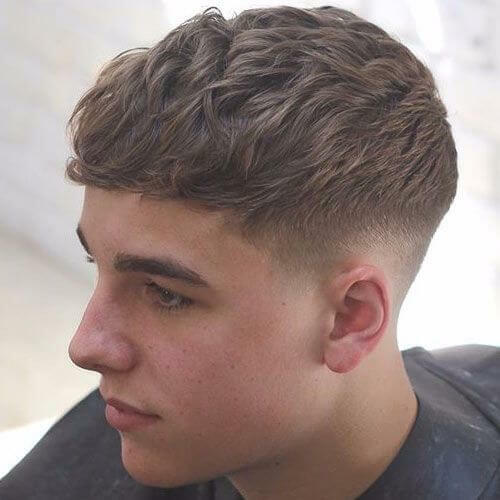 This mid fade haircut will definitely go well for those who like to highlight their retro, hipster, military, and creative inspired look. 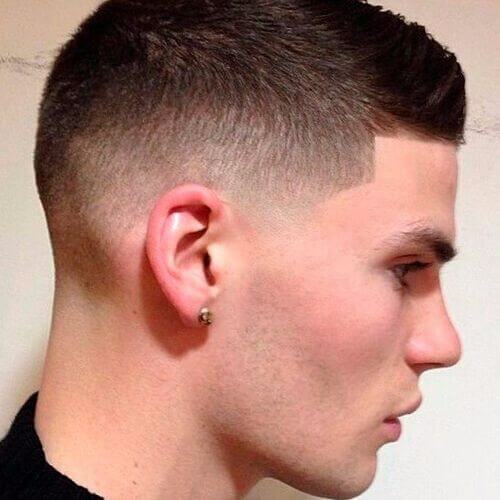 If you like a more polished look, this sleek mid fade haircut is the way to go. The trendy hairdo looks gorgeous, especially given the layers that start at the front hairline and end all the way in the back. 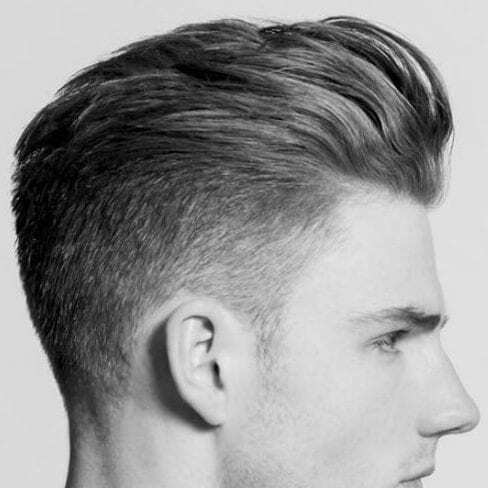 It seems that undercuts and mid fade haircuts are some of the most popular hairstyling combinations. If you’re into experimenting with different looks, give this hairstyle a go. 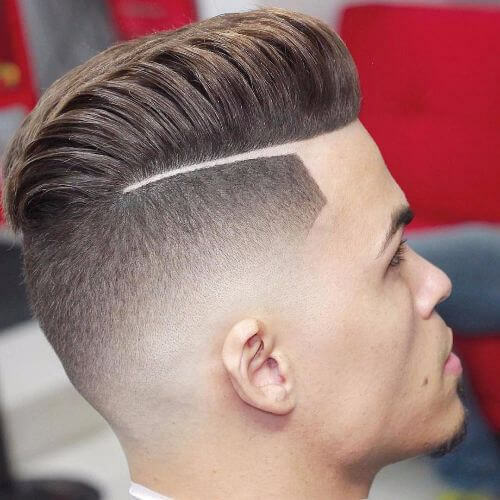 Nothing works better than a mid fade haircut that draws attention to your long-at-the-top hairstyle. The waves and curls here are simply magnificent and will garner all the attention from the ladies. 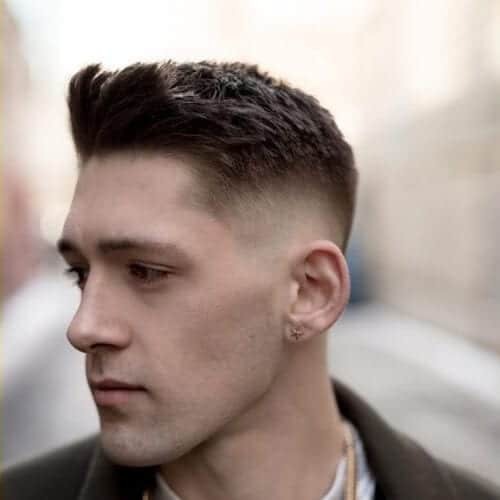 Short wavy hair and a mid fade cut can go a long way. 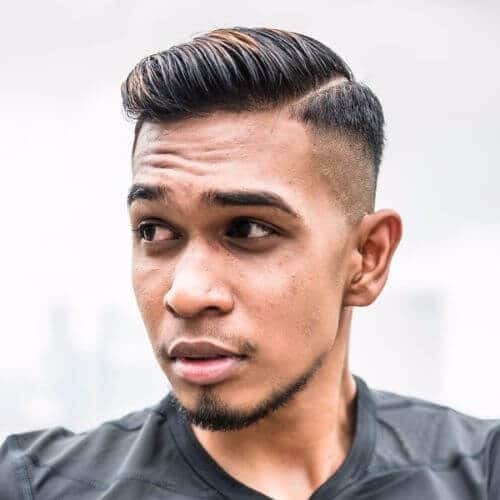 It’s a creative hairstyle that deserves a chance, especially if you have the right type of hair to pull off this kind of hairstyle. If you aren’t into intricate high maintenance hairstyles, check out this trendy look. It’s a simple, low maintenance haircut that looks incredibly sweet and casual. 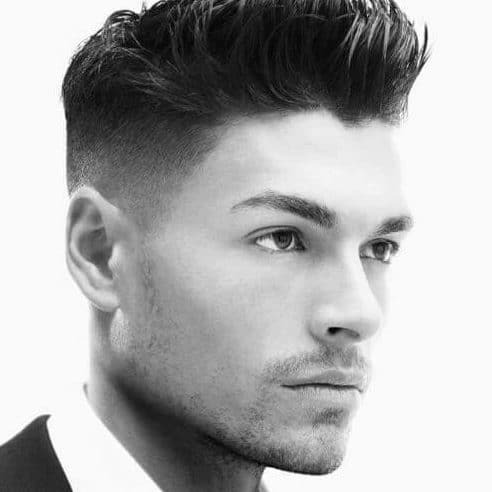 If you are aiming for a more natural look, go for a tousled mid fade haircut. It’s the kind of hairdo that everybody seems to love, based on the 2000s spikes we all used to wear. Are you in search for the trendiest hairstyles out there? This cool mid fade works wonders for both formal and informal outfits, depending on your accessories and how you style it. 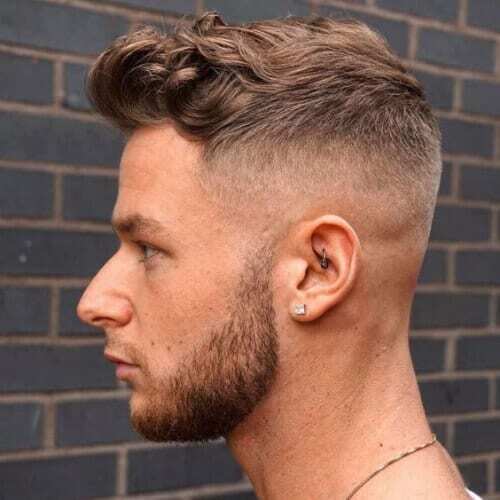 More and more men are going for a mid fade. It’s hip, it’s here, it’s trending. The great thing about this hairstyle is that it flatters all hair types, making it easier for you to style your hair. 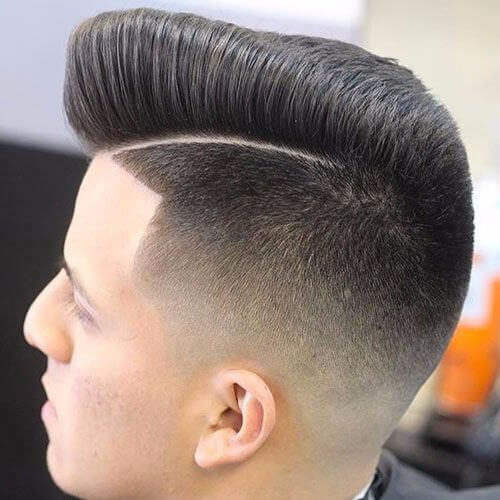 Nothing compares with a flawless pompadour highlighted by a mid fade hairdo. This somewhat retro pompadour has modern accents, allowing you room to pick more urban outfits to wear. Afro hairstyles have always been a fine choice. 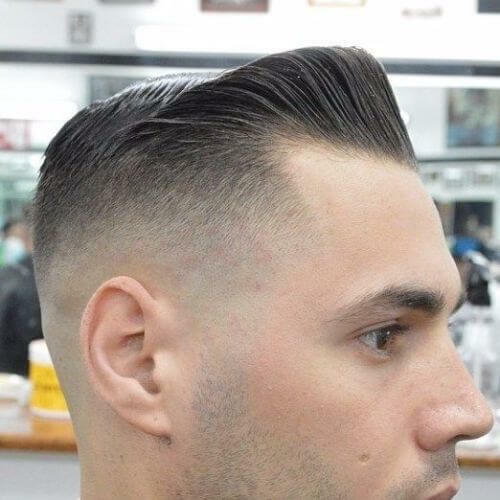 Add a mid fade haircut to the mix and you have a winner. It will bring this classic hairstyle into the 2010s and give it a modern spin. 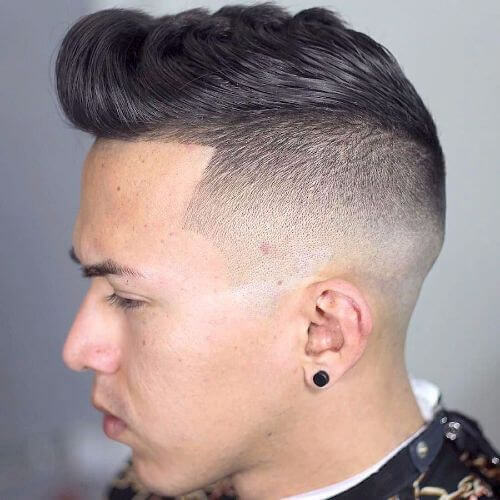 The cool guy look can be achieved by going for a fashionable mid fade style that looks effortlessly chic. The accessories for this one include some earrings as well as studs and possibly nose rings. 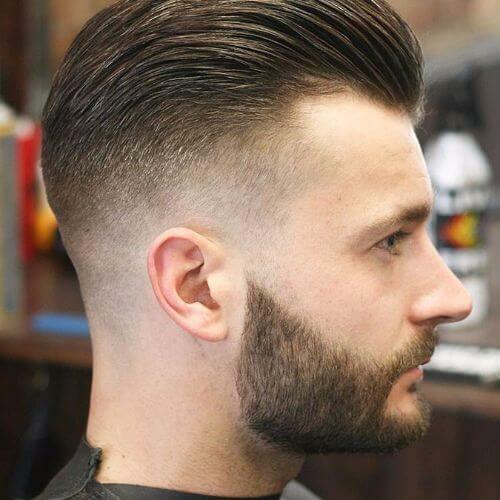 You can always style your top and choose to go with fades sides. 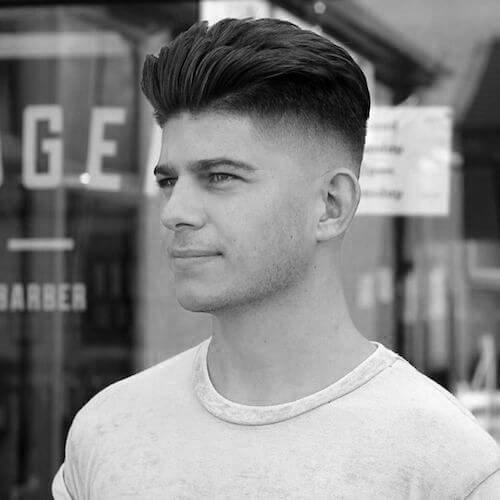 The mid fade haircut is so versatile, making it easy for you to choose different hairstyles to add to the mix. 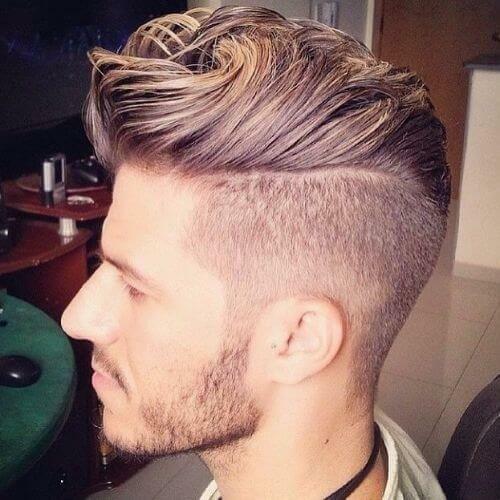 The long top can be parted to one side, highlighting a cool undercut and a simple mid fade hairstyle. Ask your barber to give you a hard part if you really want to channel that old glamour. Curly hair has never looked so spectacular! 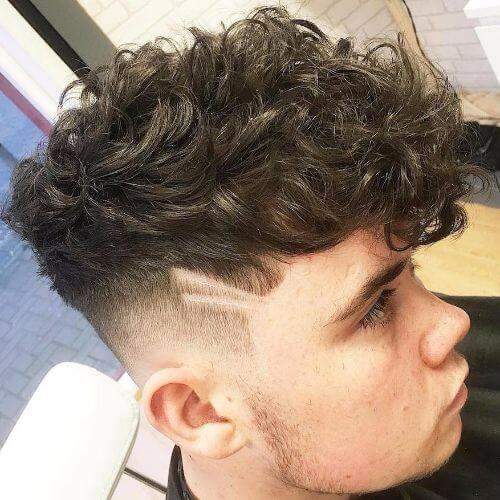 If you’re not into long curly hair, you can keep it longer at the top and trimmed at the sides by choosing a mid fade hairstyle. 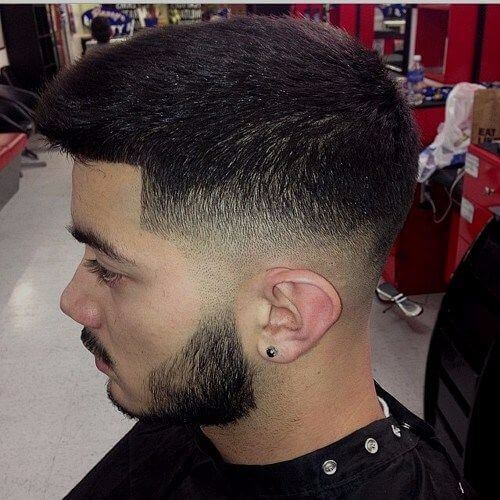 A layered long top with blunt cuts and a mid fade haircut can prove to be the right choice for any face shape. The choppy ends will give you a debonair look perfect for casual outfits. 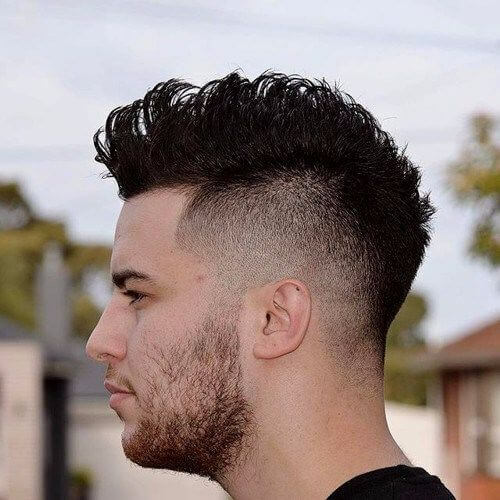 The mid fade can work very well for a more formal look too. This business outfit is highlighted by a cool mid fade hairstyle and a styled top which you can take to the office. You can style the long top in a thousand cool ways. 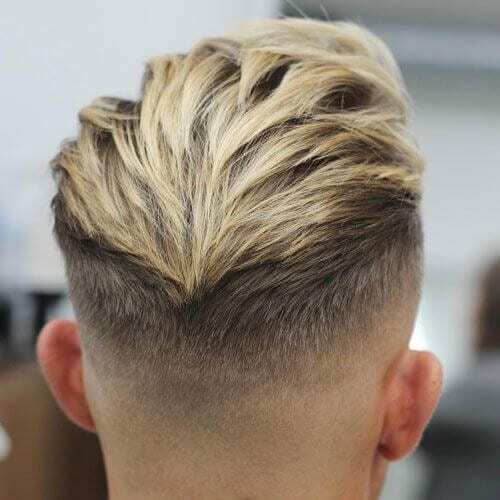 Use hair gel and a comb to get that slick look and let the mid fade highlight your styled locks. In the olden days they used to wet the comb. The styled bangs, the sleek texture, and the mid fade hairstyle look a bit edgy but flattering nonetheless. 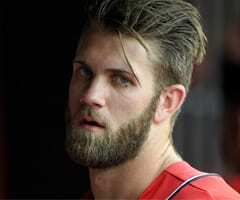 This is definitely not a hairstyle for the faint of heart, so you might want to consult your stylist before you proceed. 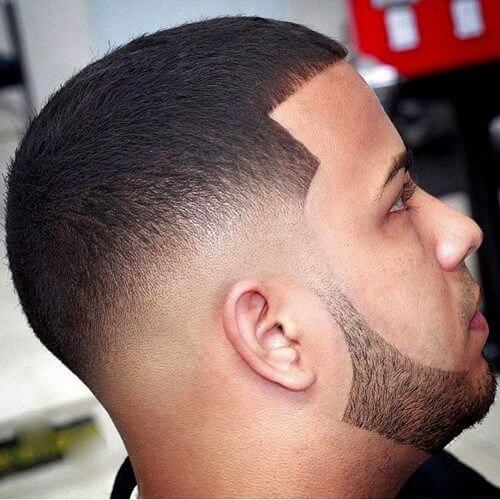 The groomed beard, the trimmed hair, and the flawless mid fade haircut are the trademarks of a modern gentleman. 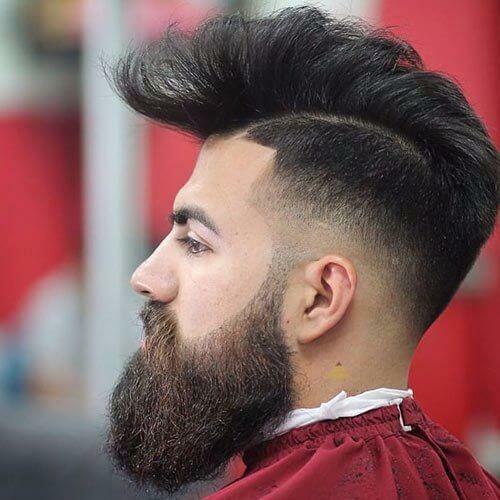 We also love that the mid fade creates a disconnect between the actual haircut and the beard. 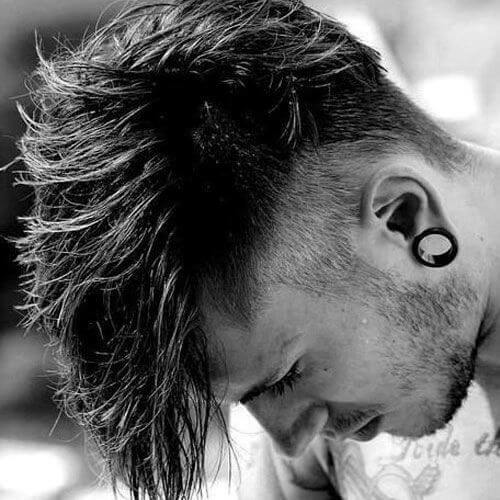 If you like to highlight your rebellious side, go for a Mohawk and a mid fade look. It can be styled easily and it doesn’t require excessive maintenance, except for a lot of hair wax. You can always go for something practical such as a short mid fade hairdo that won’t require effort and time to be styled. It needs no primping and it is definitely one of the best low maintenance hairstyles out there. 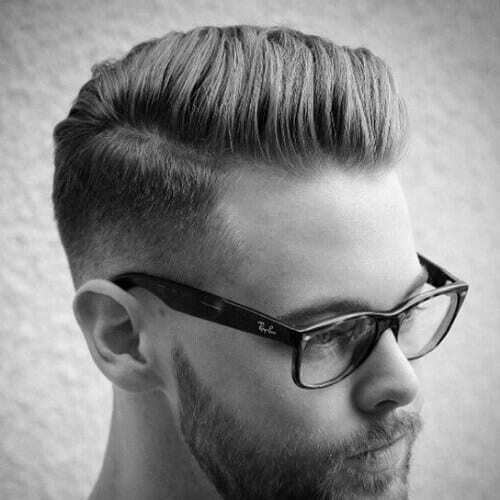 A spiked up back medium top and a trimmed mid fade hairstyle can easily go with a fancy fashion style. We love the color palette of the clothes here as well as the small yet powerful star-shaped earring. This is yet another short, inspired low maintenance mid fade cut. A goatee can better highlight this kind of hairdo. In fact, if you are interested in goatees, here is an entire article with ideas on the goatee and mustache combo. A retro hairstyle can be highlighted by a more modern one. 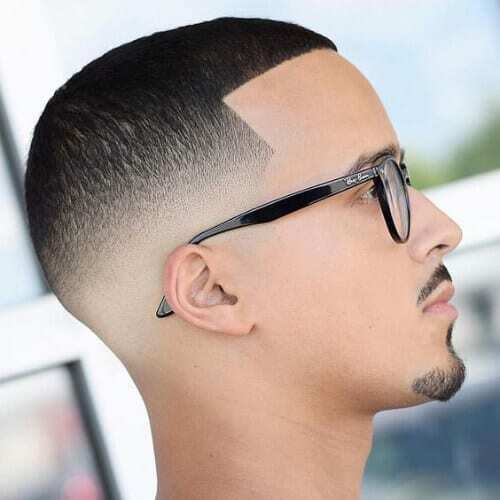 A mid fade haircut can draw attention to a retro, sleek haircut, especially if you also sport some amazing classic glasses. 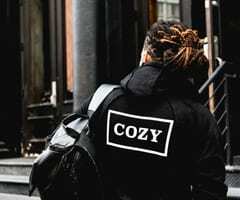 Go for a messy, spiky hairdo and a trending mid fade if you like edgier looks that go well with many different outfits. Even though spikes were all the rage back in the 90s and 2000s, they received a massive upgrade. 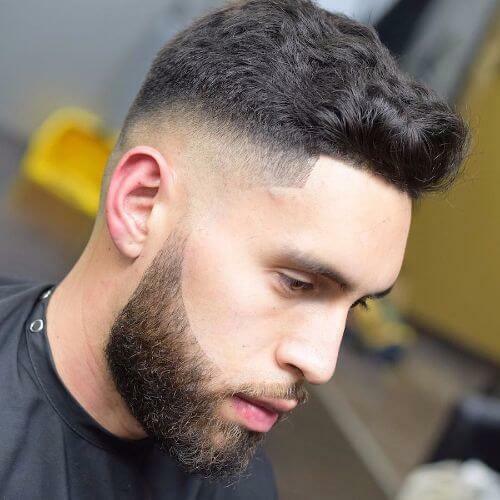 There are many variations of the mid fade look. 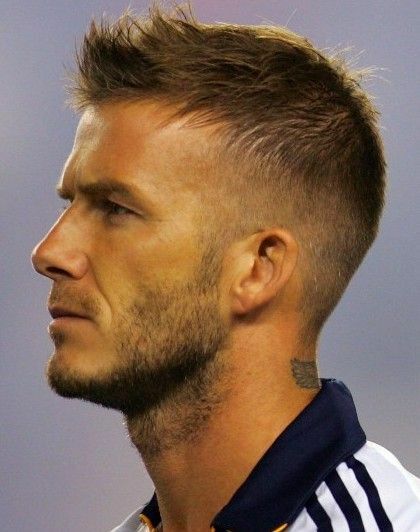 This hairstyle in particular is a popular choice among many men who prefer sporting short haircuts. It looks great on gentlemen who have thick hair as it gives them a way to battle that problem. Long curls deserve the spotlight. 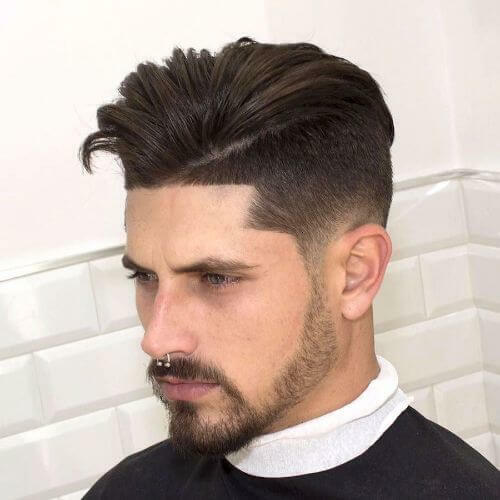 Why not highlight them with mid faded sides, then? 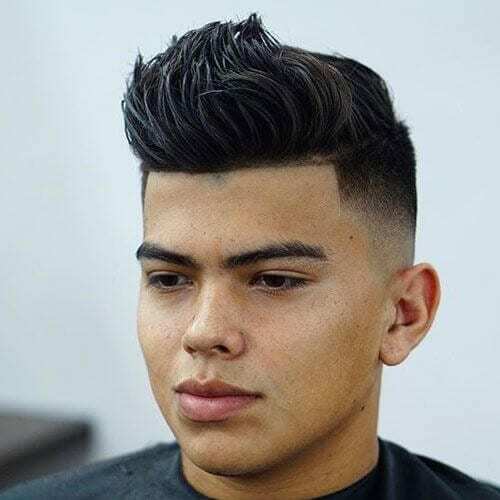 This modern hairstyle is among the most preferred choices by men, since it also sports a small but powerful hair design or hair tattoo. A well-trimmed beard deserves an impeccable haircut. The subtle waves add texture to this iconic look which also has the beginning of a small pomapdour in the front. That’s how you can start growing it out. This cute guy-next-door look deserves a chance. It’s a super easy to style hairdo and the mid fade is a nice touch. Plus, the quiff in the front looks like the icing on a very yummy cake. The teased ends and the mid fade cut add volume to fine, thin hair. It’s the best choice for men who want to get more hair volume but who also want to keep things on the elegant side. This is the kind of hairstyle that never goes out of style. 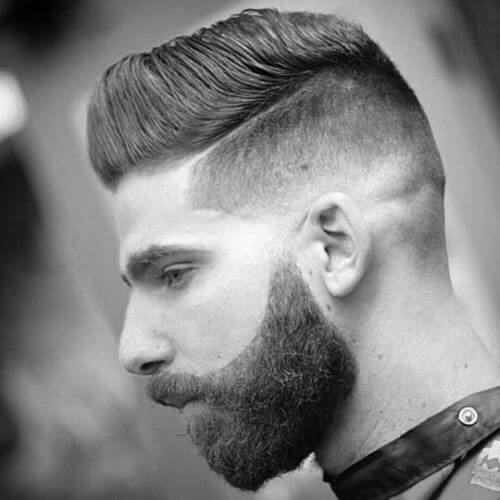 The teased ends, the layers, the styled top, and the perfectly trimmed mid fade hairstyle can make any man easily stand out in the crowd. Sergio Ramos the most of all. 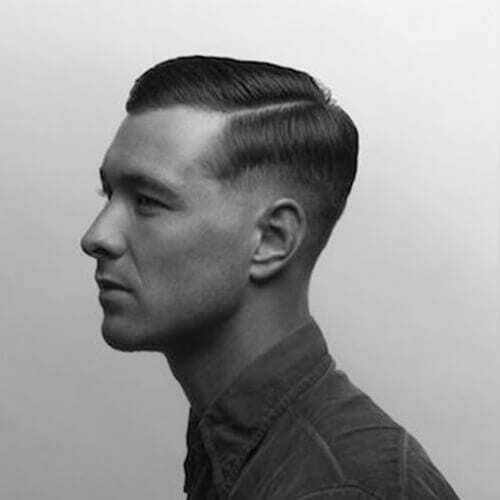 This comb over reveals a dramatic undercut, a larger than life hard part, and a mid fade hairstyle. 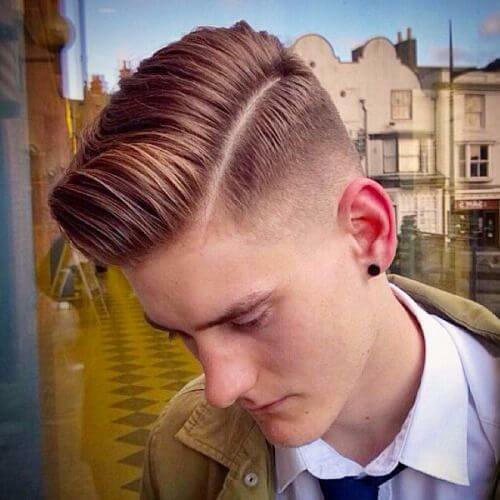 The vintage air of the comb over is softened by the modern touch of the undercut and mid fade. This chic look is recommended for younger men who love all things trendy and edgy. It’s the kind of hairstyle that needs some maintenance seeing as it’s incredibly large, but you will get used to it in time. 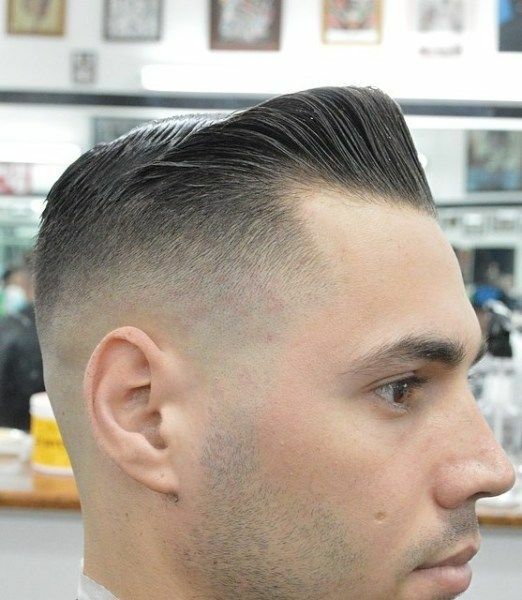 The best compromise for a mid-length hairstyle is to go for a mid fade cut. This way you get to enjoy the warm weather without having to choose a shorter hairdo. Speaking of warmer weather, this sandy blonde will be perfect come summertime. Go for natural looking highlights for a summer look. 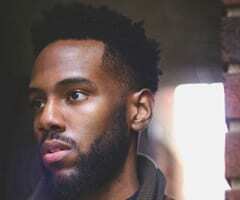 The faded sides can easily draw attention to your laid-back, natural hairstyle, especially when you’re lounging on the beach with a cocktail in your hand. 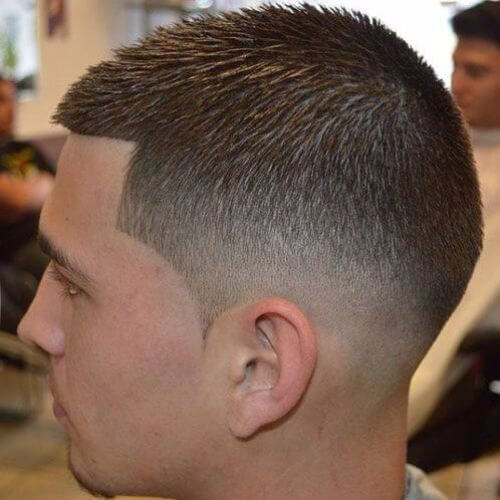 Hair gel or hair wax can easily turn your mid fade hairstyle and top in a smooth looking hairdo. Luckily, this kind of hairstyle doesn’t require excessive styling to look this awesome. Your natural smolder will do the trick. 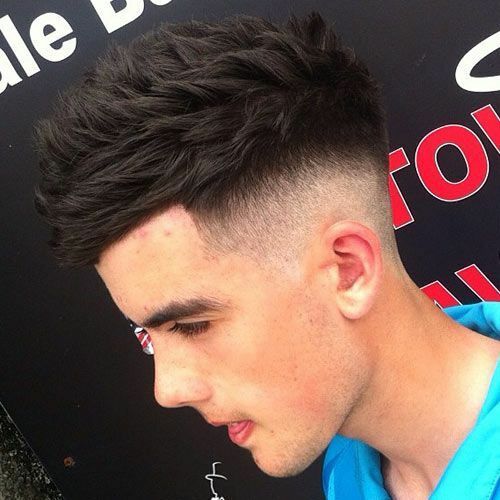 There are plenty of short mid fade haircuts to choose from. 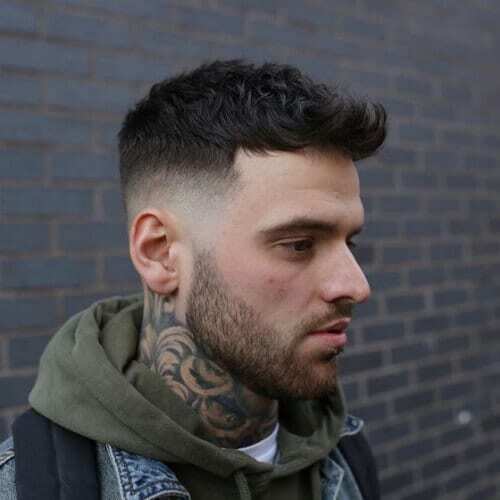 If you like sophisticated hairstyles, it’s time to consider any variation of the mid fade plus an awesome neck tattoo to go with it. Another edgy look that deserves a go is the faux hawk. 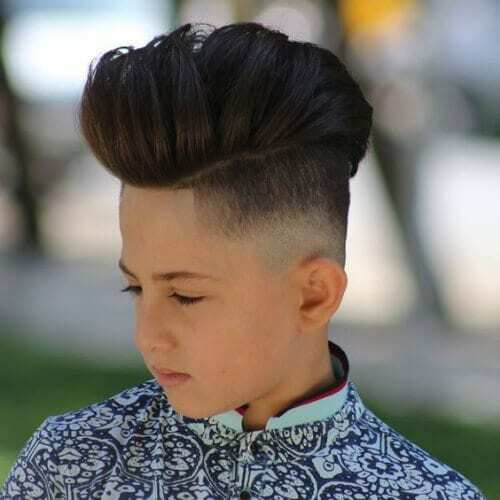 Combine it with a mid fade haircut and your bad boy image will be better highlighted this way. Don’t forget about the Viking beard. 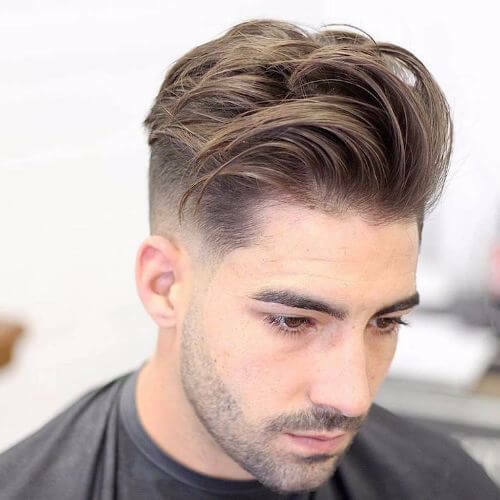 The modern man is a big fan of polished hairstyles, especially when it comes to such a versatile hairdo like the mid fade one. This hairstyle will require a comb and a lot of hair wax. This modern hairstyling choice is reserved for men who like to highlight their rugged side. It draws its inspiration from the military but still has enough pop culture in it to make you look cool. Rejoice because the wet look is back. 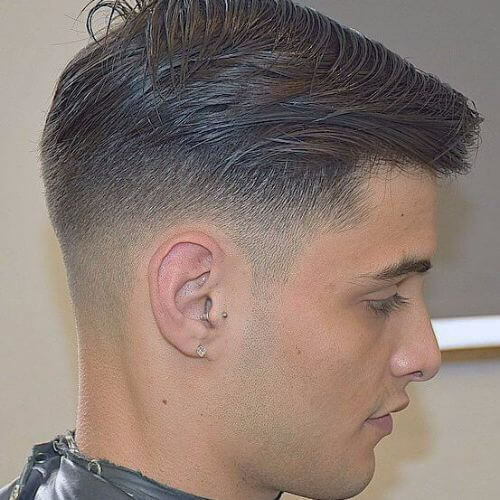 This was the preferred bad boy look of the 90s, and it consisted of a medium haircut parted down the middle dabbed with too much hair gel. Now it’s back in the shape of a mid fade with a long top and an equal amount of hair gel. 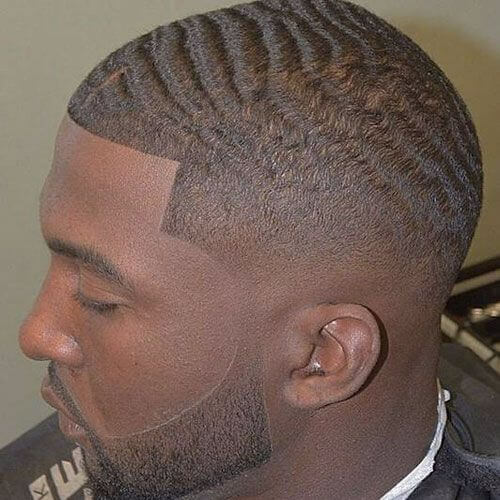 This former Directioner is a major fan of the taper fade. We cannot say we don’t agree with him because this hairstyle suits his beautiful and delicately carved facial features to perfection. 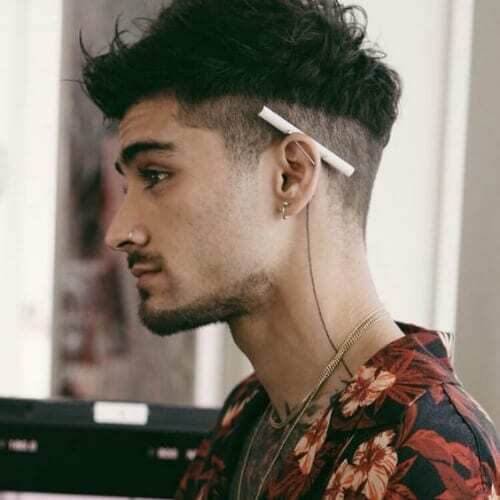 Zayn sports an edgy look with earrings, studs, nose piercings, and massive tattoos that threaten to take over his neck and face. 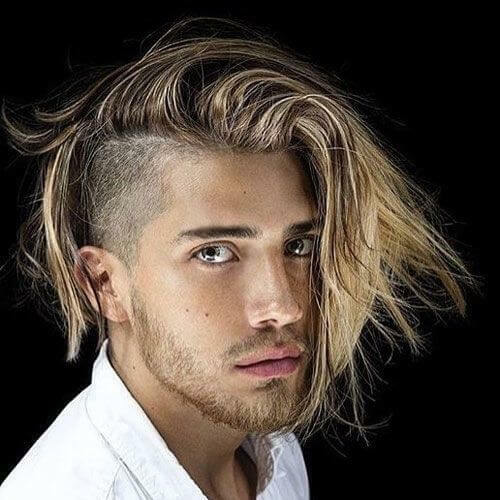 If you really want a bold hairstyle, you can try this half shaved half medium long haircut. Granted, it’s not exactly your father’s choice for an office haircut, but times have changed, and we need to change to keep in tune. Here’s a perfect example of the three most beloved and controversial hairstyles of the past few seasons. 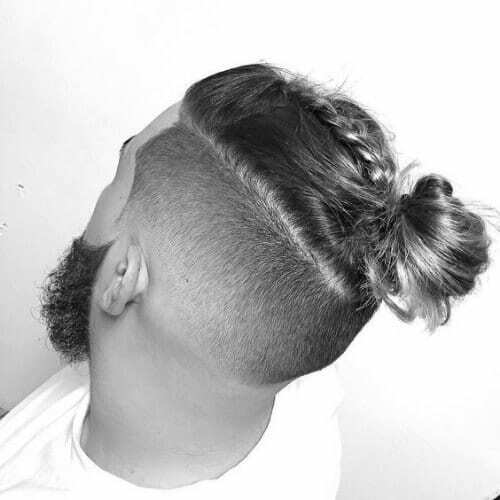 You can see a taper fade plus the notorious man bun that caused rivers of digital ink to flow, plus the much newer but equally mind boggling for some man braids. Another major trend of the past seasons has been the non-conventional hair color. 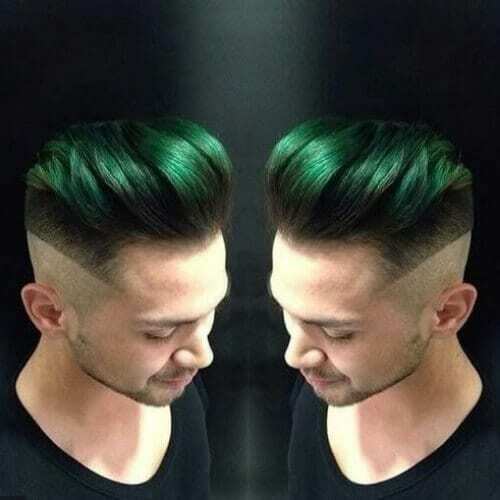 You can try to dye your mid fade haircut any color you want, including this awesome metallic green we found. 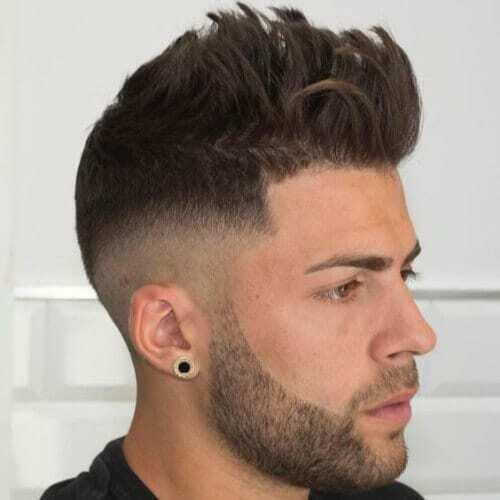 The mid fade haircut has been the belle of the styling ball for a few good seasons now, and it doesn’t seem like there are any contenders to its throne just yet. Therefore, we suggest you hop on this trend as soon as possible. Start with a visit to your stylist. Choose an idea from our list and show him or her what you would like to get!